I've dropped hints on the blog before that I work in internet marketing as my real job. The reason I bring this up again is that my job specifically is to work with Google/Yahoo/Bing to make sure that my company is bidding on the proper search keywords to show up in each search engine's paid advertisement listings. Anyway, when I look at the name of this Stonyfield product, I get a chuckle because I can just imagine some pervert looking for the search term of "pure pleasure on the bottom" or some variation and then their search results coming up with my review in the results even though that is not what they intended at all. Anyway, maybe I only find that funny, but it did provide some amusement for me on a sleepy morning. 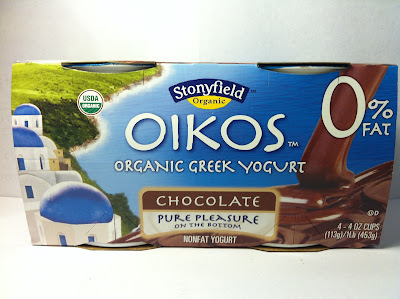 So, I've reviewed one Stonyfield Pure Pleasure product before and that leads me to another flavor of the product line with a review of the Chocolate flavor. I picked this one up at Meijer with a free product coupon, but it usually retails at $4.69 for a four pack of these four ounce cups. Each cup contains 100 calories, has ten grams of protein and says it is zero fat despite the fact that the nutritional information on the back of the cup says there are five calories from fat. 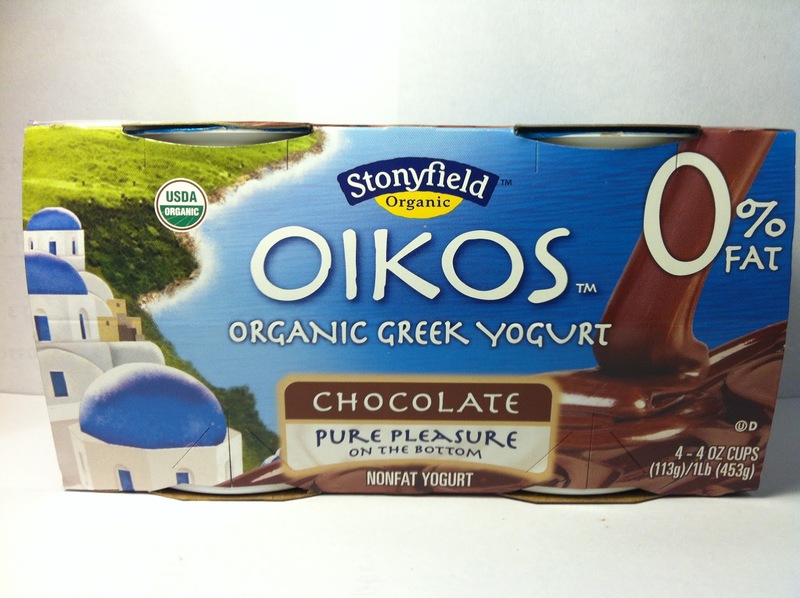 As you could infer from the name, the pleasure, or chocolate in this case, is on the bottom of this Greek yogurt cup. Like the caramel flavor before it, I found that the chocolate shifted to one side, which was odd, but not a big deal since I just mixed it up anyway. The yogurt itself was Stonyfield's typical plain Greek yogurt that has a tart and tangy smell, along with a physical texture of being thick and creamy. The chocolate was of a dark brown milk chocolate color and also very thick and creamy as well, so knowing that, I was anxious to dive in and see if the chocolate tasted as good as it looked. Along with the milk chocolate coloring, the chocolate in this yogurt cup tasted like milk chocolate too and being that I am preferential to milk chocolate when compared to all the other variations of chocolate, I was quite pleased by that. It was sweet, but not overly sweet and that sweetness blended well in its thick and creamy texture. 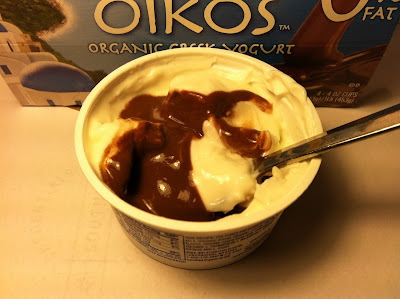 Unfortunately, once you mixed the chocolate with the rest of the yogurt, it kind of lost its magic as the plain yogurt's tang and tartness overpowered the chocolate. You could still taste the chocolate, but it was very much a secondary flavor and was very faint. Disappointing, but not enough to make this a failure of a product. Buy It or Fly By It? It's a good thing that Stonyfield puts out such a solid tasting plain Greek yogurt, because if it tasted bad, this would be an all around loser of a product. But, since their plain yogurt is so solid tasting, this is a tasty treat, especially when mixed with a faint sweetness of chocolate and I have to give it a BUY IT rating. It might be a little costly, but if you can pick this up on sale at the store, you should definitely go for it. The yogurt itself is probably what is 0% fat - the chocolate is most likely the supplier of the fat content. Technically, the label isn't quite lying. Just being rather deceptive. Too bad I can't find this flavor anywhere locally. I have 2 free coupons but all I can find are the honey and caramel flavors. Both of them are good, but I was hoping to find chocolate. Wow the picture you show of the product is completely different than what I received in my 4 oz cup. Yours actually looks good. Mine looks all soupy and tastes horrible. It is one of the worst things I have ever eaten. I don't ever mix mine into the yogurt, I swirl it so that you have both flavors alongside one another instead of diluted. Yummm! It's like eating an ice cream sundae, one would never blend it all together. Try it that way and give it a new review. if you liked spoiled chocolate milk, then go right ahead and eat this product. i could barely keep from retching after wiffing it once.